Relapse has released a solid crop of albums in 1Q09. Cerebral Metalhead will review one of them a day this week. Grindcore's all about the whole-band assault, the ampjacking blitzkrieg that kicks ya in the nuts and doesn't stick around long enough to hear you make the high-pitched sound that you make when you're kicked in the nuts. 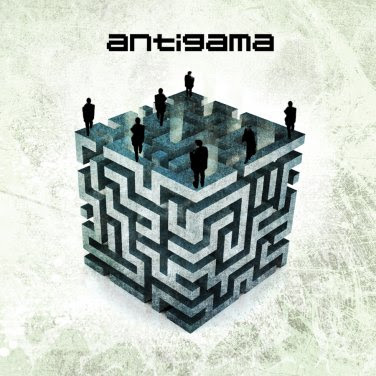 Poland's Antigama perform their fair share of testicle-smashing hit 'n runs on their fifth LP Warning, but there's also a nasty strain of weirdness that runs through the album like crude oil through the Druzhba pipeline. Said musical fuckery goes beyond deliberate red herring tracks like "Sequenzia Dellamorte." Warning rarely misses an opportunity to undercut its own blasting brutality with treated guitars, rock 'n roll swing ("Lost Skull") or 7/8 grooves ("Empty Room"), and my GAWD, drummer Krzysztof Bentkowski does some awfully cool things with cymbals and toms. Grind turning in upon itself in recursive patterns, perfectly evoked by Orion Landau's Escher-esque album art. That Warning is essentially a re-write of their last album Resonance (2007), down to the throwaway second installment in Antigama's "Barbapapex" franchise, matters not at all. Once again, Antigama integrate the quirks perfectly with the jagged blasty stuff. What might have been yet another Locust-style, spazz grind band has become one of the more forward-thinking grindcore acts we've got today.